Look! More Jester King Collabs! Woodchuck’s new summer offering is Woodchuck Ginger. The ginger lends the cider a spicy “zing.” John Matson of Woodchuck wanted to source organic ginger. That was easier said than done. As it turns out, there is only one place in the United States that grows organic ginger – that’s Big Island, Hawaii. Once the ginger was procured, getting the ginger into the cider was no picnic either. Fegley’s Brewworks, just released their first organic beer – Green Monsta’. It is a West Coast style IPA hopped with Chinook and CTZ and brewed with organic malts. The brewery states it has Monsta’rous hoppy flavors, pine, and grapefruit. Tapping this weekend at Bethlehem’s first VegFest this weekend. 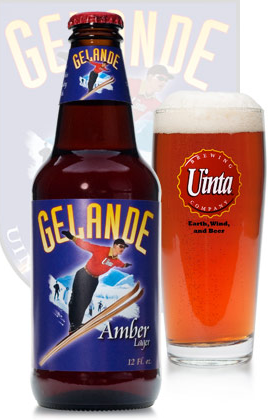 Uinta Brewing (Salt Lake City, UT) has been rebranding recently. 3 more beautiful labels have surfaced. Wyld– Organic Pale Ale, 4 %. Available year round. Monkshine – Belgian Style Pale Ale, 6.8%. Available year round. The 3rd edition in Peak Organic Brewing’s 2011 bomber series will be an imperial German Hefeweizen. This is the first hefe by the Portland, Maine based brewer. Both the hops and malts in Peak’s beers are 100% USDA organic. 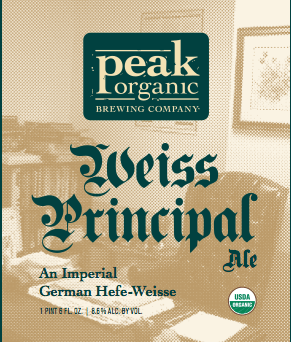 Weiss Principal will be available in 22oz bombers & draft.